Citation Information: J Clin Invest. 2017;127(7):2719-2724. https://doi.org/10.1172/JCI92087. 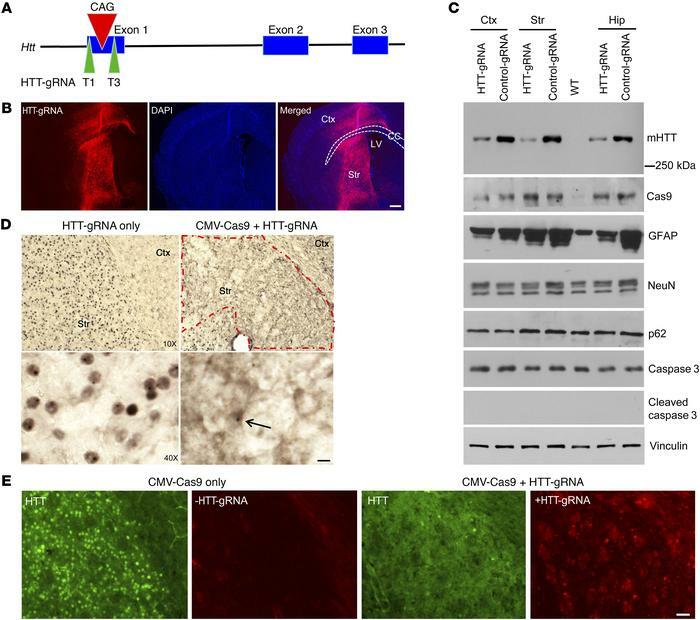 CRISPR/Cas9 depletes the ubiquitous expression of mHTT in homozygous HD140Q-KI mouse striatum. (A) Schematics of the designed HTT-gRNA (T1 and T3). (B) Immunofluorescence showing the transduction of AAV-HTT-gRNA in the striatum and part of the cortex. Ctx, cortex; Str, striatum; CC, corpus callosum; LV, lateral ventricle. Scale bar: 100 μm. (C) Different brain regions from 9-month-old homozygous HD140Q-KI mice injected with AAV-CMV-Cas9 and AAV-HTT-gRNA (T1 and T3) or control-gRNA were analyzed by Western blotting with 1C2 for mHTT and antibodies against Cas9, GFAP, NeuN, p62, caspase 3, and cleaved caspase 3. Vinculin was used as a loading control. Hip, hippocampus. (D) Low- and high-magnification images show the reduction of nuclear HTT and HTT aggregates in the AAV-HTT-gRNA/AAV-CMV-Cas9–injected area in 9-month-old homozygous HD140Q-KI mice compared with the contralateral striatum injected with AAV-HTT-gRNA only. Arrow indicates a remaining cell with nuclear HTT inclusion. Scale bar: 10 μm. The red dashed outline indicates the injected region where mHTT aggregates are markedly reduced. (E) Double immunostaining confirmed the depletion of mHTT in the area expressing HTT-gRNA in the injected striatum of 9-month-old homozygous HD140Q-KI mice. The striatum of a HD140Q-KI mouse injected with AAV-CMV-Cas9 only was used as a control. Scale bar: 20 μm.